Serpas Court Reporting is your source for the highest quality professional court reporters and services to the legal profession. We take a small town approach to serving our clients' needs - from scheduling a deposition to transcript delivery - making it simple, convenient, and affordable. We provide Court Reporting Services for the parishes of Orleans, Jefferson, St. Tammany, Tangipahoa, East Baton Rouge, not to mention All other parishes in Louisiana. Unlike the national franchises, we employ certified reporters who have been tested, proven and recommended for their skill and professionalism. And as a south Louisiana court reporting company, we also know what it means to bring that "little bit extra" to our customers. That's the lagniappe tradition that makes working with us a pleasure as well as a smart business choice. We understand how precious your time is; it is not to be wasted on scheduling services for your upcoming depositions. Make just one call to Serpas, and we'll handle the rest - conference rooms, videographers, translators, etc. Our goal is to provide our clients the best professional services and the most practical technology to accomplish their objectives. We welcome your feedback and the valued input from clients and associates in order to continue to provide top-level service. Please contact us anytime. Our Certified Shorthand Reporters are available for depositions, trials, hearings, arbitrations and meetings throughout the state of Louisiana. 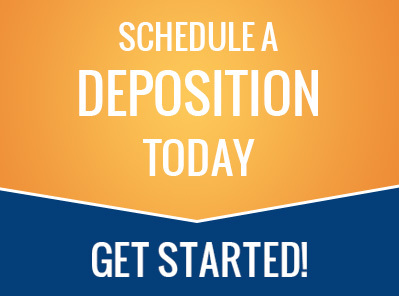 Need to schedule a deposition on short notice? No problem. Today, technology allows us to deliver your transcripts in (the format that you and your firm prefers. Whether it be PDF formatted transcripts, E-transcripts (PTX format), Exhibit-linked PDF transcripts, TXT format for Summation, etc., we cater to each and every client’s need. We offer in-house videoconferencing services for depositions, arbitrations and hearings. Our complete range of services provide a convenient and economical alternative to travel. "This was a last minute deposition and Kim helped me out so very quickly and with an excellent location for Dr. Rice's Deposition. Thank you so very much." "I love the service provided by Serpas Court Reporting! I never thought I would have been raving over a court reporting service but here I am. Not only are they friendly but also dependable! I have called them within an hour of a deposition and was still provided a court reporter." "Seriously, you guys are the best! I've never had a more pleasant experience with any other company than y'all." Serpas Court Reporting has begun to offer digital transcripts and exhibits to clients on a secure web portal. As part of Serpas' ongoing effort to streamline document archiving and delivery, we provide our clients convenient access to transcripts and other materials at no additional charge. "We see the industry moving toward completely digital transcripts," says owner, Raymond Serpas. "Our goal is to bring added convenience and efficiency to our clients. Many of the attorneys we work with work after hours, on the road, or from home over the internet. With our digital files, legal professionals will be able to access their transcripts and exhibits from anywhere in the world. That means good, billable hours and better productivity."